BORN TO BATTLE (1927, Cody Productions) Bill Cody, Barbara Luddy, J.P. Lockney, Nora Cecil. Bill is framed for his own father’s murder. The trail to the killer leads to a family feud that began decades earlier. On top of that, Bill falls for the niece of his dad’s killer! Pretty decent Silent Cody. Music score, From 16mm. BORDER GUNS (1934, Aywon) Bill Cody, Blanche MeHaffey, Franklyn Farnum. A Mexican revolutionary spreads murder and terror throughout Arizona. He and his thugs steal cattle to feed their rebel band, which is on the other side of the border. Bill drifts into town and finds himself in the thick of things. 16mm. 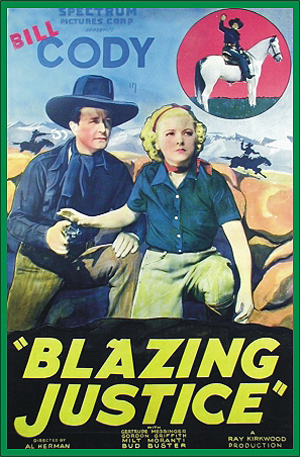 BLAZING JUSTICE (1936, Spectrum) Bill Cody, Gertrude Messinger, Gordon Griffith. Bill’ a good-natured cowpuncher who captures a couple of outlaws. There’s a reward of $5000! Bill starts out on vacation, but his newfound wealth gets him in trouble and he ends up framed up for murder! 16mm. CYCLONE RANGER (1935, Spectrum) Bill Cody, Nena Quartero, Eddie Gribbon. Cattle rustlers try to go straight but seem to find trouble wherever they go. They eventually wind up at the ranch of a blind woman who thinks that one of them is her lost son. From 16mm.